This is a scalable context timeline. It contains events related to the event May 31, 1996: FBI Brings Armored Vehicles, Helicopter to Freemen Siege. You can narrow or broaden the context of this timeline by adjusting the zoom level. The lower the scale, the more relevant the items on average will be, while the higher the scale, the less relevant the items, on average, will be. All forms of organized government are illegitimate and have no right to perform duties routinely assigned to governments, from collecting taxes to requiring automobile licenses. They can also act as their own central banks and defraud the government, financial institutions, and area merchants. 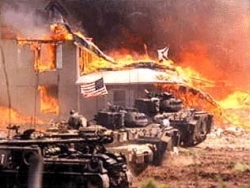 Davidians Set Fires throughout Compound - At 12:07 p.m., according to the Justice Department and House reports, the Davidians start “simultaneous fires at three or more different locations within the compound.” An FBI Hostage Rescue Team member reports seeing “a male starting a fire” in the front of the building. Later analyses show that the first fire begins in a second-floor bedroom, the second in the first floor dining room, and the third in the first floor chapel. Evidence also shows that the fires spread according to “accelerant trails,” such as a trail of flammable liquid being poured on the floor. Some of the Davidians’ clothing found in the rubble also shows traces of gasoline, kerosene, Coleman fuel (liquid petroleum, sometimes called “white gas”), and lighter fluid, further suggesting that the Davidians use accelerants to start and spread the fires. [PBS Frontline, 10/1995; House Committee on Government Reform and Oversight, 8/2/1996] Within eight minutes, the main building is engulfed in flames. One explosion, probably from a propane gas tank, is observed. Later investigation will find a propane tank with its top blown off in the debris. [House Committee on Government Reform and Oversight, 8/2/1996; House Committee on Government Reform and Oversight, 8/2/1996] After the compound burns to the ground, FBI agent Bob Ricks tells reporters, “David Koresh, we believe, gave the order to commit suicide and they all willingly followed.” [New York Times, 4/20/1993] Some of the Davidians who survive the conflagration later claim that the Davidians did not start the fires, but arson investigators with the Justice Department and the Texas Rangers, as well as an independent investigator, will conclude that Davidians did indeed start the fires in at least three different areas of the main building. [PBS Frontline, 10/1995] A 1993 Treasury Department report (see Late September - October 1993) will produce audiotapes of Davidians inside the compound and transcripts of conversations, secured via electronic surveillance, discussing the means of setting the fires. Voices on the tapes and in the transcripts say such things as: “The fuel has to go all around to get started.” “Got to put enough fuel in there.” “So, we only light ‘em as they come in,” or as a slightly different version has it, “So, we only light ‘em as soon as they tell me.” Once the fires begin, high winds and the breaches in the walls cause the flames to almost immediately begin consuming the compound. [Dean M. Kelley, 5/1995] In 1999, Colonel Rodney Rawlings, the senior military liaison to the HRT, will tell reporters that he heard Koresh give the orders to start the fires over FBI surveillance “bugs” (see October 8, 1999). Sage later describes the horror that goes through him and his fellow agents when they realize that the Davidians have torched the compound. He will recall “pleading” with the Davidians to leave the compound, and say: “I can’t express the emotions that goes through you. I had to physically turn around away from the monitor to keep my mind focused on what I was trying to broadcast to those people.” He will recall being horrified by the failure of people to flee the compound. “I fully anticipated those people would come pouring out of there,” he says. “I’d been through CS teargas on numerous occasions [in training exercises]. And I would move heaven and earth to get my kids out of that kind of an environment. And that’s frankly what we were banking on. That at least the parents would remove their children from that kind of situation.” Of Koresh, he will say: “By him intentionally lighting that place afire and consuming the lives of 78 people, including over 20 young children, was just inconceivable to me. In 25 years of law enforcement I’ve never been faced with someone that was capable of doing that.” [PBS Frontline, 10/1995] Six years later, the FBI will admit to releasing two pyrotechnic grenades into the compound, but insists the grenades did not start the fires (see August 25, 1999 and After). Entity Tags: Karl Ohs, Montana Freemen, John Connor Jr.
Jack McLamb during his days as a Phoenix, Arizona, police officer. [Source: Jack McLamb]The FBI refuses to allow three “celebrity” would-be negotiators to enter the Montana Freemen compound, currently surrounded by federal and local authorities (see March 25, 1996). 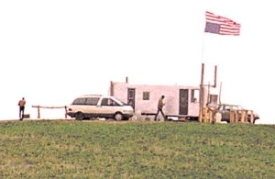 Famed “Patriot” leader James “Bo” Gritz (see March 25 - April 1, 1996), Gritz’s associate Jack McLamb, and Ruby Ridge survivor Randy Weaver (see August 31, 1992) offer their services as negotiators, but are not allowed to go through the perimeter. [Mark Pitcavage, 5/6/1996] The FBI will eventually allow Gritz and McLamb to attempt to negotiate with the Freemen (see April 27, 1996). 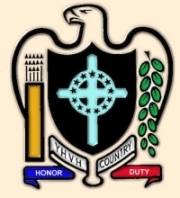 The FBI allows “Patriot” militia leader James “Bo” Gritz and his partner, former police officer Jack McLamb, to take part in negotiations to end the siege of the Freemen compound outside Jordan, Montana (see March 25, 1996 and April 25, 1996). The two men helped end the Ruby Ridge siege in Idaho (see August 31, 1992). 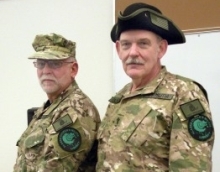 Most law enforcement officials do not like either Gritz or McLamb, but they hope that with the two’s established credibility in the militia movement and their success in Idaho, they may be able to negotiate a successful surrender. Garfield County prosecutor Nick Murnion says: “There’s some hope. I think [Gritz] is of the right political persuasion, and certainly probably has more credibility with these folks than a lot of potential negotiators. So he does seem to offer them the possibility to come out in a more dignified manner.” After seven hours of negotiations with the Freemen, militiaman Stewart Waterhouse, who joined the besieged Freemen weeks before (see March 25 - April 1, 1996), leaves the compound, and authorities begin to hope that Gritz and McLamb are making headway. But Gritz gives mixed impressions in his initial reports to the press. He says the situation is “bridgeable,” but seems to fundamentally misunderstand the Freemen, saying that they “have no white supremacy, separatist tendencies that I saw. None at all.… They brought up the fact and said, ‘Where is the media getting the idea we have any prejudice or bias?’” Many of the Freemen, including leader Rodney Skurdal, have produced inordinate reams of court documents and other statements laced with virulently racist and anti-Semitic diatribes. Author Mark Pitcavage will later write, “In any event, there was something that Gritz was not ‘getting.’” [Mark Pitcavage, 5/6/1996; Billings Gazette, 3/25/2006] Gritz and McLamb will give up after four days (see May 1, 1996). A flurry of talks between FBI negotiators, outside parties, and the holed-up Montana Freemen (see March 25, 1996) signals that the 80-day standoff is about to conclude. Yesterday, LeRoy Schweitzer, the jailed leader of the Freemen, gave his blessing for a surrender (see June 11, 1996). A 16-year-old girl, Ashley Landers (whom federal authorities say is legally named Amanda Michele Kendricks), voluntarily leaves the compound; a local prosecutor says she will be taken into state custody. She was the last child left inside the compound. Karl Ohs, a Montana legislator acting as a mediator between the FBI and the Freemen (see April 17, 1996), arrives in nearby Jordan, Montana, to help conclude the final surrender negotiations. Agents in flak jackets dismantle the tent-like shelter at the compound’s entrance, used for meetings between Freemen and negotiators, and other agents drive three passenger vans to a nearby church, apparently in preparation for the Freemen’s surrender and departure. The FBI wins the cooperation of neighboring farmer Dean Clark, who tries to begin planting on 2,300 acres adjacent to the Freemen ranch; he agrees to delay planting for a day. [Associated Press, 6/13/1996; New York Times, 6/13/1996] The next day, the Freemen surrender peacefully (see June 13, 1996). 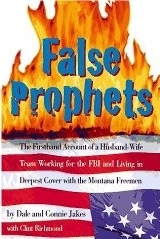 Six Montana Freemen (see 1993-1994, March 25, 1996, and June 13, 1996) are tried in a district court in Billings, Montana, accused of being accessories to helping fugitives avoid arrest during the FBI siege of the Freemen compound. Four Freemen will be ejected from the courtroom for being disruptive during the trial; the four attempt to derail the proceedings by cursing and screaming. All six Freemen have refused to participate in their defense, rejected their court-appointed counsels, and refused to dress themselves for the trial. “It’s a difficult trial to get prepared for,” says Lisa Swanson, who represents defendant James Hance. “He won’t talk to me. The only way he would talk with me is if I would denounce my membership in the American Bar Association.” Three are dragged in and out of the courtroom after refusing to walk, and one is transported in a wheelchair. As they are taken into the courtroom, they yell “non-assumptus,” their term for their claim that the judge has no authority over them. Another defendant, Steven Hance, yells at the presiding judge, “Let the record show I’m placing you under arrest,” and curses him. Hance then knocks over a chair and tries to knock over a computer monitor. A third defendant, James Hance, curses the US Attorney prosecuting the case, Sherry Matteucci. [New York Times, 3/16/1998; Los Angeles Times, 4/1/1998; Billings Gazette, 3/25/2006] Five of the defendants will be convicted (see March 31, 1998). Five Montana Freemen (see 1993-1994, March 25, 1996, and June 13, 1996) are convicted of serving as accessories to helping other Freemen escape arrest during the 81-day standoff (see March 16, 1998 and After). Steven Hance and his two sons, James and John Hance, are convicted of being accessories and for being fugitives in possession of firearms. 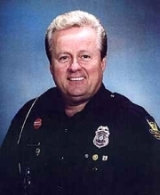 Barry Nelson, who joined the Freemen during the standoff (see March 25 - April 1, 1996), is convicted of being an accessory. Elwin Ward is acquitted of accessory charges, but found guilty of submitting a false claim to the Internal Revenue Service. Edwin Clark is acquitted of all charges. [New York Times, 4/1/1998; Billings Gazette, 3/25/2006] The Hances and Nelson will receive lengthy jail sentences (see June 6, 1998).